A new study from the University of Pennsylvania’s Kleinman Center for Energy Policy credits the abundance of Marcellus Shale natural gas for a 40 percent reduction in natural gas bills in the Commonwealth compared to a decade ago. And, as the report notes, this trend is being seen nationally too. 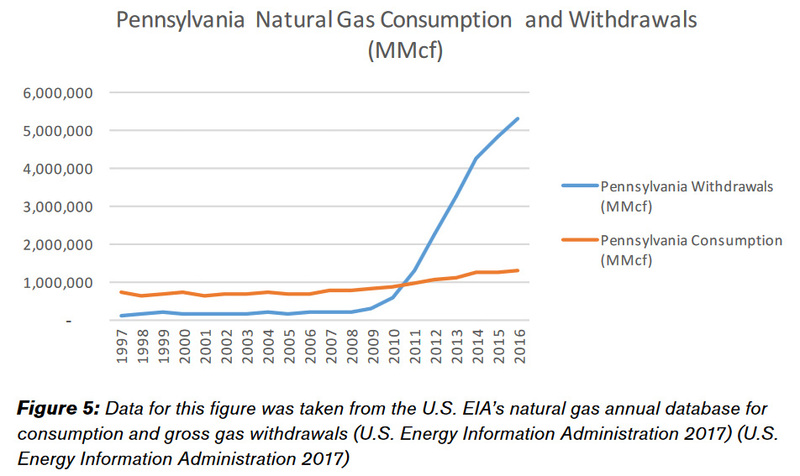 In fact, Pennsylvania went from consuming four times more gas than it produced in 2007 to becoming a net exporter of the resource in 2011, and exporting or storing 75 percent of the gas produced in the state by 2016. This was done at the same time that overall gas demand within the state increased by 50.5 percent, compared to a national increase in demand of 18.5 percent. The end result is that Pennsylvania’s consumers are seeing significant reductions in the price of gas today versus a decade ago. It should be noted (and is in the study) that Pennsylvania has historically had higher natural gas prices for residential consumers than the national average, and that is still the case. But, as the study explains, residential prices are falling at a faster rate (40 percent or a decrease of $6.79/Mcf) than the national average, which is also decreasing dramatically (34 percent or a decrease of $5.09/Mcf). The industrial and commercial sectors have seen even more of an impact, with the PA Hubs Average – a proxy for Pa. industrial and commercial gas commodity prices – decreasing 65 percent from 2010 to 2016, while the Henry Hub has seen a lower, but still impressive, 44 percent decrease during that time period. The largest reductions, both in Pennsylvania and nationally, occurred in the electric power sector, where the price reductions were 79% (a decrease of $7.32/Mcf) and 65% (a decrease of $5.47/Mcf), respectively. Gas demand has increased by 250 percent in the electricity sector since 2007 – transitioning from the smallest sector to the largest for natural gas demand – and is driving the increased overall demand for the state. That is a trend that is also being seen nationally, with U.S. electric power sector demand growing by 46 percent from 2007 to 2016 and taking the slot as the highest user of gas by sector. As EID recently reported, that growth in Pennsylvania’s electric sector shows no signs of slowing down, with new natural gas power plants slated to bring more than $10.5 billion in investments and 12,359 megawatts (MW) of power to the Commonwealth over the next few years. This latest study represents an important part of the Marcellus story – namely how even though shale development takes place in select parts of the state, it really is benefitting the state as a whole, and particularly consumers. As cold weather sets in this week and many Pennsylvanians turn on the heat for the first time this season, it will be costing them far less than a decade ago thanks to the Marcellus Shale.